Recently I had my 5th sip and see for my 4th grandson. The 5th grandchild to have a party over a ten year period, I had almost run out of steam. After four previous celebrations, ten pounds and ten years, it took a lot more energy to get me motivated. Note that the operative word here is almost. I gutted up and got moving when I realized that time was running out. At six and a half months, he was already sitting up,thinking about crawling. It was time to bite the bullet. If I didn't get on top of it, he would be leaving for college before I knew it. Lucky for me I got on the case in the nick of time. Weighing my options I remembered the precious baby announcements my daughter-in-law had given to me to send out to my friends. They were still sitting on my desk. Not one to waste a thing, I concluded that saving money on stamps and envelopes was my first priority. Thus came the brilliant idea of sending out the birth announcements and invitation in one fell swoop. I rationalized that this was a much more personal agenda than the evites that were filling up my inbox. The theme "a hodge-podge day" came into my mind. The baby was named Hodge because his parents thought it sounded really good with Strother, his brother's name. The real reason, of course, is that pulling the whole thing together in one afternoon felt like a hodge-podge to me. I did print up styrofoam cups in blue that said "A Hodge - Podge Day - anything goes." A great hit with the younger crowd. Everything came together beautifully in spite of my slow start. Hodge was precious of course, smiling and cooing on cue, enjoying the limelight as he showed off his sitting and hand/knee coordination. I couldn't have been prouder. Lesson learned. Don't put off today what you can or should have done yesterday. If I had not taken the bull by the horns, little Hodge would have been the only grandchild without a Marme welcome to the world. And that would have been a "hodge-podge" travesty. Welcome to the world little one. We did it! Let me introduce myself.Iam a wife, mother of two, and grandmother of five. I am also a therapist,freelance-writer, bookeeper,volunteer, workshop trainer, and author. I love the fall mountains,a cool summer breeze and snow. I look forward to growing old with my children and grandchildren, but I plan to make the most of each day in the time I have left. 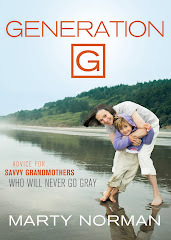 Check out my book "Generation G - Advice For Savvy Grandmothers Who Will Never Go Gray" on amazon.com.